It was the first summer like weekend last Memorial Day. It was also my first time to be spending my day outdoor since the allergy season has started. The sneezing, teary eyes and runny nose are gone. Thank you for all that rain last week that washed all the pollen. I tried and tested a lot of over the counter drugs before I found one that is non drowsy for my allergies. My friend suggested to check some Canada drugs but I have not experienced on how is buying medicine overseas so I settled to what I got. To buy non prescription drugs is easy unlike if you have to buy lipitor for your cholesterol, a prescription from a doctor is needed. When we were at the lake last weekend, the day started as cloudy and people were kind of scared to go in the water but the sun did not disappoint the swimmers at all. It became steamy hot late in the day giving us a good tan. It was indeed a welcome treat for the summer. I am more familiar with toblerone bars - a triangle shape long bar then i saw these individually wrapped (like candies) on top of one of the counters at my job. When it's there, it means they are for everybody so i grabbed one of each kind. 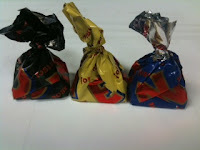 The yellow is the regular chocolate, the black is dark chocolate and the blue is half white chocolate and the regular one. Toblerone is one of my favorites so no need to tell how yummy they are. During the family day at my daughter’s school, it was a happy atmosphere around the school area. It was a well attended affair with booths selling food, home decors, doing face painting and there was a lot of activities for the kids. The kids had so much fun. The drizzle did not scare them away; the fun just continued until it was closing time. So we it was really a wonderful weekend for the school. Come Monday morning, it was a totally different scenario at the school. There were police cars all over and cops inside the school. A mom who was also bringing her child to school told me that the school had a break in over the weekend. Laptops and money were taken! How and when did it happen? No one knows yet but the school was open during the weekend so that people can use the rest room inside the gymnasium during the fun day Saturday. When I got home, I called my friend right away to get in touch with the home security Starkville. She was still undecided whether to sign up at Localtv-Satellite.com for their home security but you can never be lax on safety. It is always better be safe than sorry. How could these people steal from of all places – the school! The cops even called my babysitter because she lives next to the school if she saw anything unusual last weekend but she was not able to give them any answers since she was at work that time. Hope they get all the leads and eventually catch the perpetrators soon. Saturday was the family fun day at my daughter's school. Here is a picture taken during one of her breaks munching a cotton candy - a blue cotton which she personally pick to match her shirt! We went to Arby's recently and we were surprised how their sandwich got smaller. I ordered my favorite french dip and swiss toasted sud and it looks like a kid's meal. At their website, you see layers of meat but look at the picture of my actual sandwich. Hubby has to order another sandwich because it was not enough. In fairness, their curly fries are still the best. This is the steakhouse onion rings. My daughter's pick. I did not have any but they are big onion rings. I have read on the news that gas prices have gone done a little bit but I do not see any change every time I fill up my car. I drive a V6 engine car and I spend around $40 every week for my gas to work. It used to be around $25 per week. A co-worker who lives at the border of Pennsylvania and new jersey pays twice as much every week. She drives the Ford Mustang, a replacement of her 10 year old car she bought at from a very reliable used car dealer in Tampa that can be found in http://www.tampa-used-cars.com. That was the first car she bought after she graduated from college in Florida then she moved here at the East Coast two years go. Even if she bought that car as a used car she was still able to get a high trade in value. My plan to get a car is put on hold for now. I have other priorities like my school to take care of. I can wait another year or two before buying my dream car. Do not ask me which car yet. I have three in my mind. I have to pick which among the three. As soon as I have it in my driveway, I will take a photo and share it with you guys. I have mentioned few weeks ago that my friend bought a house here in our town. They have been doing a lot of tlc’s on the house that we never got the chance to meet up for dinner. So, during the Pacquiao fight they finally gave us a call. We watched the boxing match at their house. It was the first time we saw their new house after they bought it. Our first impression when we got into the house is they did a very good job in fixing the kitchen. On the kitchen counter, they did a granite restoration and a marble restoration on the island. With matching new aluminum appliances, their kitchen looks brand new and updated. My friend says that they still have to do a stone floor restoration on the garage but that could wait for next year. They cannot afford another expense at the moment. So as they always say, when there is a Pacquiao fight, it brings Filipino family in the U.S. together. That was what happened last May 7th. Although the fight was not the action that we were expecting, we still enjoyed the night seeing old family and friends together again. See you guys on the next Pacquiao match. The prices are posted right at the cashier. You can buy them per piece or in combinations. 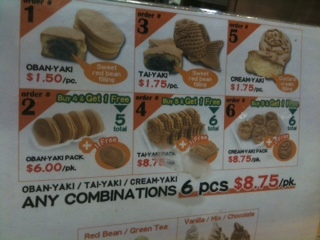 As you can see there are different shapes and fillings for obanyaki. 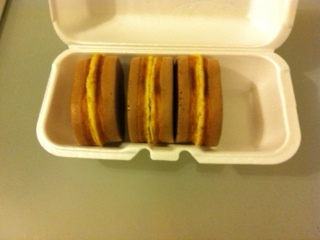 I always get the #2 order, 6 pcs with the red bean filling. If you are lucky and there is no line, you can get your food right away but normally the wait is around 10-15 minutes. It's ok, you can watch them cook the food for you. There is this one guy in our warehouse that has not been skipping work but recently he takes off a day or two for personal reasons. One day he came late to work and everybody was surprised that he was not wearing his casual working clothes but rather in a dress shirt and pants. When you ask him is he is job hunting, he will just smile back at you. Now the mystery is solved. He just tendered his two week notice to the HR department. When asked and he did not mind at all, he said he is joining a payday affiliate program like the one being offered by Blue Global Media. He will start as a publisher in one of the top affiliate networks promoting different offers from advertisers. Have you heard how affiliate marketing works? If you are interested in joining a network of affiliates, Blue Global Media welcomes application for publishers at http://www.blueglobalmedia.com. They offer high commissions and weekly payout and dedicated affiliate support to their team. Join them now and work on those leads right away. Photos on how the obanyaki is cooked. The pancake mix is poured into a bakepan with different shapes. It doesn't take that long to cook. Once the bread turns brown, it is ready. Give a few minutes before starting to eat because the filling is really, really hot. Al Pacino has to be one of the greatest actors of all time, hands down. That is why you still see him in movies after his prime age. Whenever I am watching my directstartv I am constantly seeing advertisement for new movies that are coming out that are starring Al Pacino, and every time I see one I can't wait to see that movie. I would see any movie that he was in, and I would expect it to be one of the best movies I have ever seen. He is most famous for his role in the movie scar face, but there are many other great movies that he has played in as well. The Devil's Advocate and You Don't Know Jack where both great movies, and he has received many different awards throughout his career. If you want to pick out a great movie to see then choosing anything with him in it is going to be a good place to start. He has many different movies cover different interests, like mystery and drama, and almost anything that you pick is going to be great. Al Pacino is my favorite actor and he is an icon in American history. Obanyaki is a Japanese pancake with red been filling inside. The taste of the bun is like a waffle and the mashed beans inside is sweet. 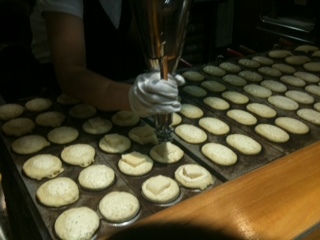 They are cooked using a big waffle pan in different shapes. Hubby calls this as japanese hopia - our favorite. My husband has been teaching tennis in this racquet club for years. It is an indoor tennis and it is in demand during the winter time. When the weather started to get warm, the owner sent out flyers to members and employees that they will do a tennis court resurfacing during the summer time. I have not been inside the racquet club but my husband says that it really needs a tennis court resurfacing badly. The tennis club has been sold and this is now under new management. Hubby is not sure if they will do basketball court resurfacing too after the tennis courts are done. It is not really a big problem that they are doing some improvement inside the racquet club now that it is summer time. They have also outdoor courts that they can play while it is being done but the outdoor playing is not happening as well most of this week because we will have rain until Friday. Right now it is already pouring hard outside. They have already canceled hubby's schedule for today. The resurfacing will not take long anyway, i think it will be ready by next week and everything will be back to normal. 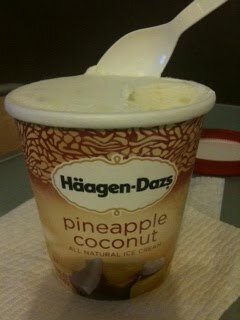 When you feel like you are missing our Sorbetes ice cream in the Philippines, try this pineapple coconut flavor of Haagen Dazs. With the mixture of coconut and pineapple on a creamy vanilla flavor, to me the flavor is so tropical. OOOhhh delicious. I could have finished the whole pint but the calories boy....gotta watch it! I'm storing a lot in my freezer!!!! I have a date with my girlfriend tomorrow night after work. It’s not a girls’ night out . I am going to their house to help her with her daughter’s prom dress. How time flies really. All of a sudden it is the season for proms again. It seems that it was only few months back when I was shopping for cheap prom dresses for the step daughter. If it's my daughter’s turn to go to a prom I doubt if I could still find some cheap prom dresses, maybe I can just remodel my old junior bridesmaid dresses for her. I can hear her protesting right now! So with my girl friend’s daughter, she wants a dress, not a gown. She is going with her boyfriend who is also Filipino. I am not sure if she will be allowed to go to the party after the prom. I heard it will be in one of the hotels in new York city. This is her first grown event with no chaperone and they will be in a limo with three of her friends. Mom is excited and also nervous. I am too. Finally, blogger is up and running. The website has been unavailable since last night. Did you have the same problem as me? I tried accessing the website both from my laptop and cellphone but it's not working. Happy that it is fixed now. Thanks. One of my customers from my online store sent me a message today complaining that he did not receive the package I sent him. He said that the package is not in one of the residential mailboxes in their apartments. And he added that the mailboxes have their own address plaques that is very visible and can never be missed. He sounded like it was my fault why he did not get the package and that I have to send him a replacement or refund his money. Before I give answers to queries like this, first thing I check is the tracking of the shipment. When I entered the tracking number at the shipper’s website, it showed that it has been delivered two days ago. Once I have this information, I am now confident to answer him back. Actually, I did not say anything to him anymore but I just emailed him the tracking information I got from the shipper. I am still waiting for his reply up to now. Hope he found it eventually or he gets it eventually from somebody who might have found the package. I am so thankful I paid extra to track the package otherwise I am in trouble right now. I know it was just a few days ago when I was talking about my own personal printer at the office. When I got to work this morning, I saw a huge machine next to the receptionist desk. When I asked my co-workers about it, they said it’s a new copy machine for everybody. It’s not an ordinary copy machine but it can also staple copies and send the copies made to an email. It can make both black and color copies. I wonder if Superfineprinting uses this type of machine too? It is about time that we get this kind of machine. With the load of brochure printing we do every month, the personal printers cannot handle the job anymore. This will become a central copy machine for the whole office. Everybody can send their jobs remotely and this machine will print it. I will still be using my personal printer for memos and letters that are not meant to be read or seen by everybody like correspondence or letters that are personal and confidential for my boss. When will be this up and running? I do not know yet. They are looking for a good spot in the office where there is a phone line for the email to work. I tried reading the manual but it is too many to learn. Maybe a quicker way to educate us on how to operate this machine is by product demo from the dealer. My foremost concern for now is how to make copies but the complicated ones I leave it to our receptionist to learn. I just heard somebody saying it looks like an alien. That is too funny. I know it was just a few days ago when I was talking about my own personal printer at the office. When I got to work this morning, I saw a huge machine next to the receptionist desk. When I asked my co-workers about it, they said it’s a new copy machine for everybody. It’s not an ordinary copy machine but it can also staple copies and send the copies made to an email. It can make both black and color copies. I wonder if Superfineprinting use this type of machine too? It is about time that we get this kind of machine. With the load of brochures and flyer printing we do every month, the personal printers cannot handle the job anymore. This will become a central copy machine for the whole office. Everybody can send their jobs remotely and this machine will print it. I will still be using my personal printer for memos and letters that are not meant to be read or seen by everybody like correspondence or letters that are personal and confidential for my boss. It’s Monday, a busy Monday again! After being pampered and being off from the kitchen last weekend, my body is in a slow mode this morning. I have so many errands to do but first I have to take care of some tickets I need for my visitors this summer. They are coming from Philippines and they want to see sports games and concerts while they are here in the U.S. I need to get New York Jets Tickets and San Diego Chargers Tickets for the boys. For the ladies who want to see live shows and concerts, I already ordered Backstreet Boys Tickets and Celine Dion Tickets. I already have three Rascal Flatts Tickets for their July show in Camden but I am wondering if who among them are interested in coming with me to the show. This show is local and only about 3 hours away from where we are so there is no problem is someone would hop in on the last minute. Are you shopping for any tickets too? I’ve got an answer for you. Visit http://acheapseat.com an online ticket broker where you can find tickets for concerts, theater or plays and sports events nationwide. Just visit their website and browse or search tickets according to your area or by categories. You can also view your seat number through the seating chart available for most events. So, do not wait in line anymore or go to any ticket booth to purchase your tickets, buy them at the comforts of your home, office or at your favorite coffee shop through ACheapseat.com and receive your tickets through FedEx in a matter of days. 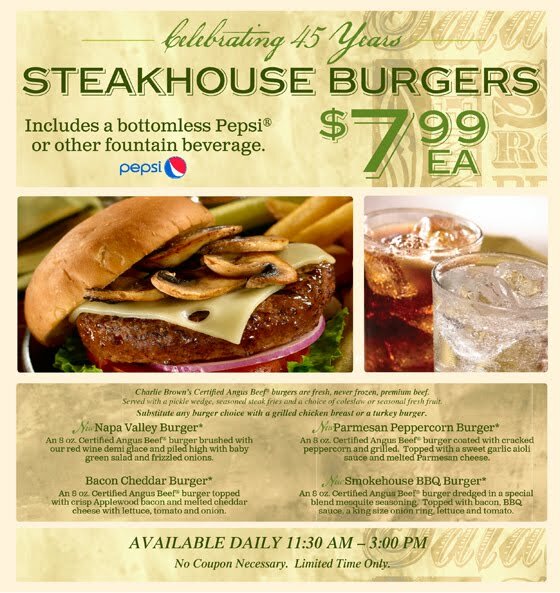 I'm In The Mood For A Burger..
..then i got this email from charlie brown. 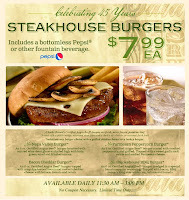 Hmmm, looks so yummy and it is available everyday! We will try it this weekend. I was thinking, it is good for lunch but the closest CB is quite a ride from my job. See you then.. I am at work right now finishing some job I left Thursday. I was not able to come yesterday because of sick daughter duties so I have to make up today. I hope that I get this job done right away but the printer ink is causing me some problems. I know they recently changed the inkjet cartridges to brand news one but I keep on getting low ink messages. This also reminds me that I have to check my printer at home. Do you know that you can get cheap ink by just doing a refill than buying a new one? Well, I learned about this when I brought my laptop for repair and they have a refill station at the shop. Wow, it surely saved me money thinking how expensive ink cartridges now! I have to make sure to be out of here before 12 noon. I tried calling home but my husband and daughter are out to get some breakfast. Now that mommy is not home, they got a chance to plan secretly for my special day tomorrow. I am not trying to ask a lot of questions to my daughter because knowing her she can easily spoil the fun. She cannot keep secrets at all. I will just keep quiet so that it will be more fun tomorrow. ...i would say that this freschetta pizza is delicious. When i got the free coupon, i got several flavors but among them this chicken, spinach and mushroom is my favorite. I love white sauce and they got the alreado sauce good. I want more but when i checked the website they only have this flavor in by slice only. They have a spinach and mushroom but no chicken. Why don't they have a whole pie? I am talking about the step daughter. She just got a car courtesy of her dad. No, dad is not paying but dad co-signed for her car loan. She tried applying a car loan on her own but she cannot get approved because she does not have any credit yet. I told her it is better not to have any credit history yet than having to repair your bad credit. She told me that she knows companies like the credit people that extends credit repair service to individuals with huge debts and not able to cope up with payments anymore. How to manage your debt and paying them off on time is the advise given to her before she was able to get her dad's go signal in getting a car for her. She promised that she will work hard to pay for that car. I know she can do it. So what is the car she got? Of course, it must be a car that is very efficient with gas. Her first choice was an SUV but when she saw the gas mileage she settled for a small car. It's a wise decision now that gas is almost $4 per gallon. Her father suggested to get a smaller car since he does not want her to be asking for gas money in the future. She laughed. So now, she is one happy teen driver. Congratulations to me for winning the contest at Freschetta. I received these beautiful storage/container sets as a prize. In addition, i also received coupons to try the Freschetta Slice pizza for free. Thanks again! The price of gold went down a little bit today to less than $1,500 per ounce due to a stronger dollar. I always monitor the gold prices by reading the New York business news since the school is coming up with a fund raiser called “cash for gold.” I volunteered for this Saturday. It is not only “cash for gold” but there are other stuffs that are on sale such as clothing and food. Most of these items are donated by parents and students to raise funds for school projects. Whoever thought of the cash for gold is a bright idea not only because the gold price is getting higher but also a good income for the school. They get a certain percentage out of the sales for that day. I tried to get involved now with my daughter’s school activity. Sometimes I cannot come to the meeting because of my work schedule so I tried to make up by volunteering. The more years that my daughter spends in this school, the more I get attached to it. It is fun to get involved. It brings back my elementary days sometimes. This is the famous Ikea swedish meatballs with mashed potatoes, cream sauce and lingonberries. Chicken fingers with french fries and cream sauce. Ikea food are not expensive, ranges from $4-$6 each, with cakes less than $2 and they have kids meals too. This is one of our favorite place to shop and dine. I am not sure if I would be able to make it to work today. I really don't want to miss the talk about Roth IRA to be given by the company that handles our retirement accounts at work. It's still a long way ahead to retirement but to be knowledgeable of how to prepare and how to save your money wisely is very important. If I cannot make it, i hope they will offer something online. Isabella has been sick since yesterday. She missed school already and I am hoping she would be able to make it later today although I left a message at the school that she would be out again. She does not have the temperature anymore but she is complaining about her stomach. She threw up this morning and now fast asleep still. Hoping that when she wakes up she will feel a lot better. So I got a message from my co-worker that the IRA people will be at my job at around 1 pm. If I can make it or not it all depends on how my daughter feels later. Let us see what happens later. You know when there is a special occasion coming up because Charlie Brown would always be the first one to send coupons or special deals in the mail. 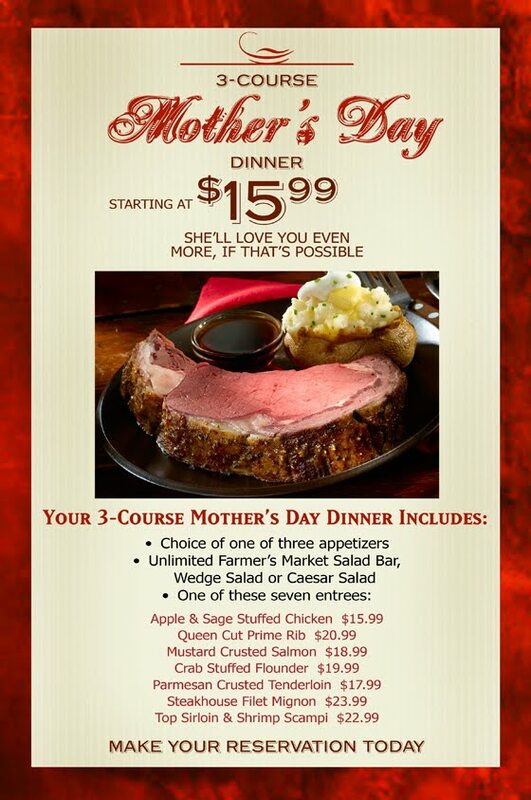 For those who are treating their moms on this special day, take a look what CB has to offer. How I wish they upgrade our server to the litespeed technology that is being offered by Ultra web Hosting. Every time that it is month end, we always experience a slower website due to heavy usage. This is usually the problem when the last two days of the month falls on a weekend. Reports, invoices and statements are being done only today and with the load from three branches, we need faster processors to handle the job. Ultra Web Hosting runs on the fast LiteSpeed Technology hosting on 8-core Xeon with faster loading websites and servers that they own and operate. They offer free remote backups and on site technicians to assist customers and do troubleshooting if you encounter problems. With their live support available all the time, you can get help right away, not just talking to a machine when you need assistance. With regards to pricing, they have servers with the most competitive pricing and if you are not satisfied with the service, you have 45 days to try or get refunded on your hosting charges. Check out the deals offer by visiting http://ultrawebsitehosting.com for easy account set up or for more information of the services they can offer you or to your company. These are the veggies i normally use when i cook sinigang - spinach, kangkong, eggplants or green beans but I never tried romaine lettuce. We had a visitor and he cooked salmon sinigang for us and i was surprised that he used romaine lettuce for veggies. And i tell you, it's not bad at all with some radish too. So now, i am cooking sinigang again and i'm going to do the same thing. Romaine lettuce is easier to find in the supermarket than kangkong or spinach - it's a double purpose now - for salad and sinigang! One of our family friend recently made a closing on a house here in our town. When they first moved in four years ago, they lived in an apartment until they decided to buy a house. They have been doing house hunting for months; finding a home that would fit their budget. Home prices are not only high here in our area but we also pay one of the highest homeowner's tax in the U.S. So finally, they were able to get a house they liked. The got a cheaper house that needs some tlc and kitchen remodeling. A design build contractor is needed in the future if they want to make an additional bedroom upstairs. It is a two family house with only one bedroom upstairs that can generate more income if it is converted to a two bedroom. This is why they got a two family. On the first floor, there is nothing to be done except for the kitchen. So now my friend is a very proud homeowner. A house blessing is happening maybe this summer. For now, they have to do a lot of clean up and painting before moving in by the end of the month. I am happy that they still live in town and only a few blocks away from where we live.